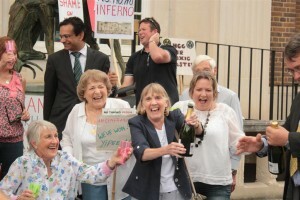 New Barnfield refusal: Another victory for common sense! 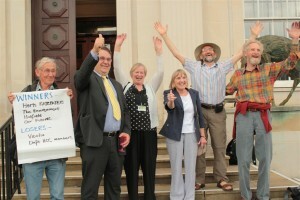 Mick Bee and other local campaigners celebrating the New Barnfield victory. The Secretary of State has agreed with the Planning Inspector to refuse planning consent for the 380ktpa incinerator proposed by Veolia for Hertfordshire. Eric Pickles, Secretary of State for Communities and Local Government, said: “Development within the green belt will not be allowed unless there are very special circumstances, and in this case, the benefits of the development did not outweigh the potential harm to the green belt”. This joins the other refusal decisions by the Secretary of State for the incinerators proposed at Twinwoods (Milton Ernest, Bedfordshire), Rainworth (Nottinghamshire), and Middlewich (Cheshire). Hampshire County Council’s June 2014 decision to refuse planning permission Clean Power Properties’ proposal for a 100ktpa pyrolysis-type incinerator at Micheldever Station. 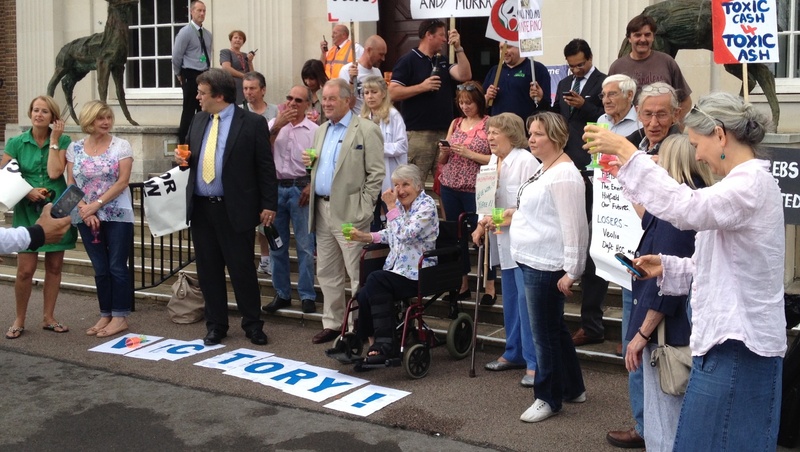 SAS Waste Ltd’s January 2014 decision to withdraw their appeal for a proposed 30ktpa gasification-type waste wood incinerator proposed for Redhill Road (Cobham, Surrey) which was refused planning permission by Surrey County Council in February 2013. R Plevin & Sons Limited’s decision not to appeal the 22ktpa biomass waste wood incinerator proposed for Elkesley (Retford, Nottinghamshire) that was refused planning permission by Nottinghamshire County Council in September 2013. The campaign against the ill-considered incinerator proposed for New Barnfield brought together a range of brave individuals and UKWIN member groups who invested a lot of time and energy into making the case against the proposal and working to help secure the refusal, including Hatfield Against Incineration (HAI), Herts. WithOut Waste (HertsWOW), Welwyn Hatfield Friends of the Earth. The proposal was also opposed by various others, including English Heritage, North Mymms District Green Belt Society, Welwyn Hatfield Borough Council, and the New Barnfield Action Fund (NBAF). Mick Bee (HertsWOW) said: “This is not the end it is the beginning – and a wonderful opportunity to rethink waste handling in Hertfordshire. This decision has instantly saved Herts ratepayers more than half a billion pounds over the next twenty five years (the cost of using the refused Veolia incinerator at New Barnfield over alternative methods). Now we have much immediate work to steer the authority away from knee jerk solutions and then towards better, more responsible and future proof ones”. John Webb (HertsWOW) said: “UKWIN gave us essential help to focus on the vital issues at each stage toward this tremendous result. Now we need to seize the initiative to get our County Council to work out a sustainable way ahead”. Cathy Roe and other local campaigners celebrating the New Barnfield victory. We thank UKWIN and Shlomo for all their advice and support, leading us through each stage of the campaign, and being available to us whenever we needed help. 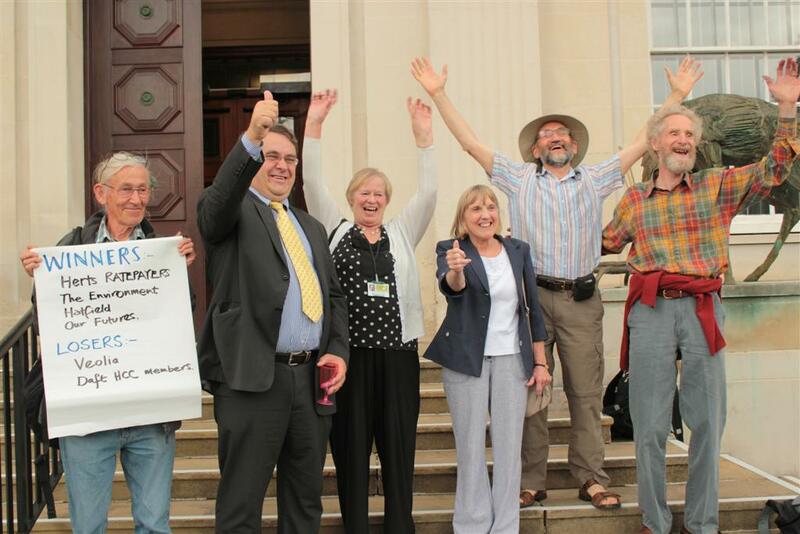 Campaigners are very, very pleased that the incinerator plan has been rejected. We now look forward to a better future. The DCLG has agreed with the decision of Inspector Richards, who led the Public Inquiry in Autumn 2013, that planning permission should not be granted for the incinerator at New Barnfield proposed by Herts County Council and Veolia Environmental Services. We congratulate all the many, many people who have contributed to this success. It has been a very long campaign and many people have put a massive amount of time and effort into it. The campaign has involved people from the communities near to New Barnfield, and people from across the county. People have worked together whatever their opinions on other issues. It was clear from the start that the plan for an incinerator at New Barnfield was wrong, as it would be damaging to people and to the environment. Herts County Council should have rejected any suggestion of an incinerator at New Barnfield years ago, before so much time and money was expended needlessly. 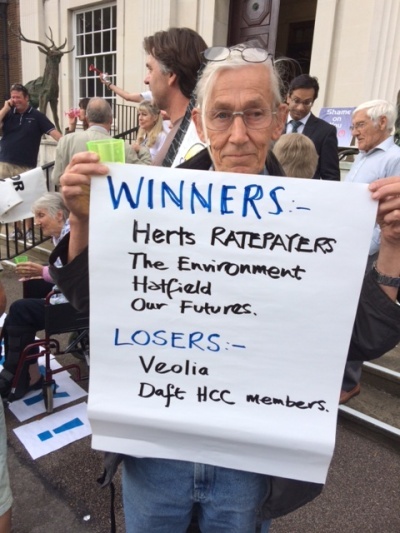 The ruling group at Herts County Council did not take note of the true facts and did not listen to what the public were telling them. Now Herts County Council needs to fully implement its own policy for waste – reduce, re-use, re-cycle – and must use methods of waste management that minimise harm to people and planet. While the Council and Veolia have the right to appeal the decision within six weeks, even a successful appeal would not guarantee that an incinerator would actually be built. It could require the decision to be re-made, but could not force the Sectary of State to approve the application. 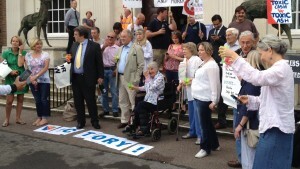 As we know from Norfolk, which lost PFI Credits and terminated their contract before the Secretary of State decided whether or not to grant planning permission for the King’s Lynn incinerator proposal, failure to obtain planning permission in a timely manner can be fatal to an incinerator contract. Great news! Every rejected application or appeal is a victory for common sense and people power!